On the door of my refrigerator, there lives a pretty unassuming little jar. Within it, I keep a ready supply of tahini. When I tell people this, I often get odd looks and questions about what it is, so I thought I'd share a recipe I enjoy that features tahini prominently in a dressing that I find incredibly versatile and downright delicious. But first, a few words about tahini. 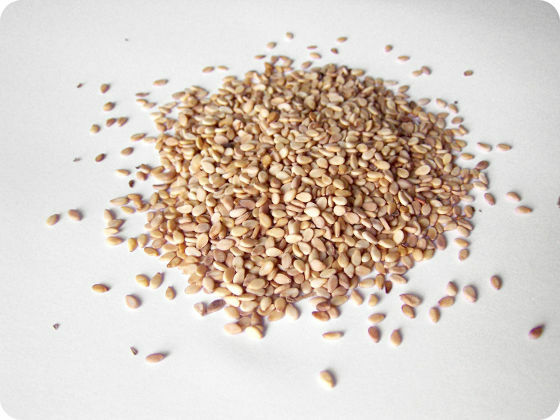 Tahini is simply a paste made from sesame seeds that are soaked in water and then crushed to separate the bran from the kernels. The crushed seeds are soaked in salt water, causing the bran to sink. The floating kernels are skimmed off the surface, toasted, and ground to produce an oily paste. It has a bit more bite to it than traditional nut butters, but a similar consistency. It's wildly popular in the Middle East and can be seen being enjoyed in savory sauces, dips, breakfast items, and even desserts throughout the region. It adds a creamy element to any dish it is added to, but tends to be used sparingly, as it is very high in calories. In this recipe, a richly seasoned tahini-based dressing is drizzled over a plate of mixed roasted squash and onions and then sprinkled with toasted walnuts and sesame seeds. It makes a lovely accompaniment to a wide variety of dishes, including pork, poultry, vegetarian curries, and even salmon. If opting to serve it alongside beef, venison, or lamb, I'd recommend using more chili oil and less tahini for a thinner, spicier dressing. For me, I can simply have a small plate of this with a bit of bread for lunch and be a very happy lady. Speaking of happy lady, I really adore using the leftover tahini dressing (there is likely to be leftovers, as it is quite rich) drizzled over a toasted half a bagel, a simple omelet, or even stirred into oatmeal with sliced green onions for a unique savory breakfast! And, of course, it makes for a very lovely salad dressing, provided your salad includes some hearty greens and vegetables that won't get lost under such a show-stopping dressing! Enjoy and Happy New Year! Preheat the oven to 425F. Put the squash and onions into a large mixing bowl. Add the olive oil, salt, pepper, and toss well. Spread the vegetables on a baking sheet and roast in the oven for 30-40 minutes or until the vegetables have taken on some color and are cooked through. Remove from the oven and set aside to cool. To make the sauce, place the tahini in a small bowl along with the lemon juice, water, chili oil, and garlic. Whisk together until it’s the consistency of honey, adding more water or tahini if necessary. To serve, spread the vegetables out on a large serving platter and drizzle over the tahini dressing. Serve the rest on the side. Sprinkle the walnuts and sesame seeds immediately before serving.